Mogul David O Selznick loaned his protégée and future wife, Jennifer Jones, to producer Hal B Wallis and Paramount for this glitzy romantic soap opera. 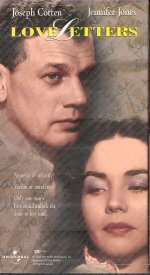 In Ayn (The Fountainhead) Rand's screenplay, Jones suffers a number of shocks, including amnesia and the traumatic discovery that her treasured collection of love letters was written not by her husband (Robert Sully) but by co-star Joseph Cotten. This stylish and enjoyable nonsense was directed by William Dieterle and received several Oscar nominations including one for Jones (as best actress) and for the title song.